Lakewood Ranch is more than just a place to live. It’s the place you live, work, and play at the same time. Featuring more than 1,200 businesses, Lakewood Ranch provides jobs to those who need it while providing all of the high-end amenities that residents want in a luxury neighborhood. From day spas to cafes, everything you want is at your fingertips. You won’t want to leave your little community. From churches to parks to playgrounds to pools, everything you, your children, and your community need is in your own backyard. Listed below are homes and condos for sale in Lakewood Ranch, FL in Manatee County. These Lakewood Ranch real estate listings are updated daily from the MFRMLS. Imagine living and playing in a green community in which everything you need is steps from your front door. Imagine finding a neighborhood in which everything you want in a community is handed to you on a silver platter. Your neighbors are more than just people to whom you send a friendly but distracted wave each morning as you pick up the paper, they’re friends. Your community is more than just a mishmash of people who all happen to live in the same area, they’re a family. Lakewood Ranch is a community in which developers found a way to marry an elegant and sophisticated lifestyle with the camaraderie of an extended family. You feel immediately at home. Lakewood Ranch is an award winning green community nestled among a myriad of lakes close to Florida’s fantastic Gulf Coast. Covering 17,500 acres, the master planners that envisioned Lakewood Ranch worked hard to become the largest green-certified community in the U.S. The numbers tell the story of the Lakewood Ranch lifestyle: 150 miles of trails, 36 world-class, private holes of golf, and 18 tennis courts. Many people move to southern Florida in search of a particular lifestyle, and Lakewood Ranch embodies that totally unique style of living. Between festivals and events such as the free monthly Music on Main concerts or the famous Pug Parade, residents always have plenty to do at Lakewood Ranch. Located a mere 20 miles from Sarasota and 50 miles from Tampa, Lakewood Ranch offers the perfect blend of Florida country living with the sophistication and energy of the Tampa Bay Area, Florida’s second most populous metropolitan center. Your children are the future of the world, which is why the education system in Lakewood Ranch was designed to ensure that your children receive a top-notch education. There are seven private schools in Lakewood Ranch, 16 preschools and early learning education facilities, one charter school, two private schools, and six higher education campuses. It doesn’t matter what type of education you want for your children, your only choice in Lakewood Ranch is a stellar education. One of the best parts of choosing to begin living a life of luxury in Lakewood Ranch is the fact that you can choose where you want to live. A myriad of neighborhoods provide every type of home a buyer could possibly want. From large, spacious, modern estates to townhouses and everything in between, what you want is what you get. If you prefer a home in which your children can play in your large backyard with the rest of the children from the neighborhood and you want to walk your little ones to school along tree-lined streets, one of the estates is perfect for you. If you prefer to live somewhere a little cozier with easy access to restaurants and entertainment, a townhome will suit you just fine. No matter which of the custom neighborhoods you choose, you will find that they all have something in common. Each home in Lakewood Ranch was built with luxury in mind. Each home features high-end upgrades and open floor plans. No amount of elegance was forgotten in the construction of the homes for sale in Lakewood Ranch. Life in Lakewood Ranch is all about casual luxury. It’s also about activity and good health. Here you will find two private golf courses, one public golf course, 18 tennis courts, and a myriad of other recreational facilities. This includes everything from cricket to polo. You’ll find more than 80 health clubs in which you can stay in shape and more than 150 miles of walking, jogging, and bike trails. This community is all about promoting a green, healthy, active lifestyle. 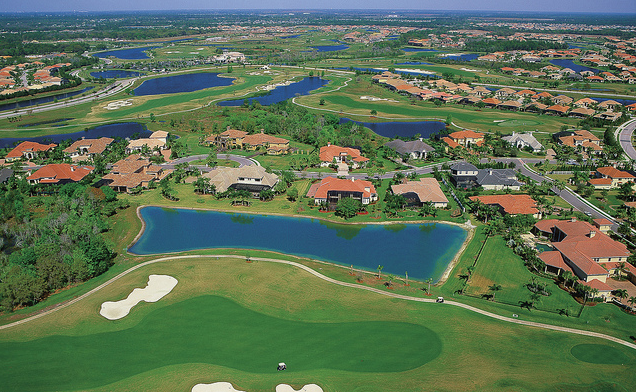 In fact, Lakewood Ranch is the largest green community in the United States. One of the primary reasons you might be tempted never to leave Lakewood Ranch is the fact that everything you need is right here. With eight top-of-the-line shopping centers to choose from, you’ll find organic supermarkets, farmer’s markets, high-end boutiques, trendy shops, antique stores, and hundreds of decadent restaurants. Spas, salons, and even the dry cleaner are all right around the corner, making your errands easy. Spend your Saturday afternoon treating the kids to ice cream at the local parlor, choosing fresh flowers at the florist, or picking up the perfect Mother’s Day present at the jewelers. When it’s time for a little romance, a good bottle of wine from one of the best vineyards in the world is yours for the picking at any of the local wine shops. The arts are not forgotten in Lakewood Ranch. From art gallery showings to theaters and the Suncoast Wine Festival, there is always something to do in Lakewood Ranch. Take the kids dancing during Music on Main or enjoy a little quality time with the person you love during Evening Under the Stars. Lakewood Ranch is more than just a neighborhood. Lakewood Ranch is a lifestyle. When you choose this luxury lifestyle, be prepared to forget the days of driving all over town looking for a quality salon or choosing from subpar educational facilities. Your life in Lakewood Ranch will become the envy of everyone who doesn’t have a home behind these gates.